Now before everyone jumps up and down and starts accusing Penny of being contradictory or even of lying – Please read on! It is well documented that Penny does not like ‘teaching’ phonics and refuses to introduce a phonics progamme into her setting, however those who have read the posts made on the subject of phonics will know that Penny has stated all along that if a child was ready to start developing a knowledge of letter sounds (phonics) and wanted to do so – that Penny would support this interest. Well this month two of the children have shown an interest and have wanted to know about letter sounds – and no it is not because Penny has introduced the new story books that she brought last year – you know the ones that are phonetically correct and supposed to be introduced in the correct order – no those books are still unread, in fact still not made it to the book shelf due to there being no room and a sort out of books needed! So how did this interest in letters make itself known? Penny had left it on the kitchen table as she wanted to wash it – and of course the children who never miss anything – spotted it and wanted to know what it was. ‘It’s numbers’ they said – that is because the children currently have an interest in numbers – especially the number 3 (important to them as 5 of the 6 children on the books are 3 and the 6th child will be 3 soon). 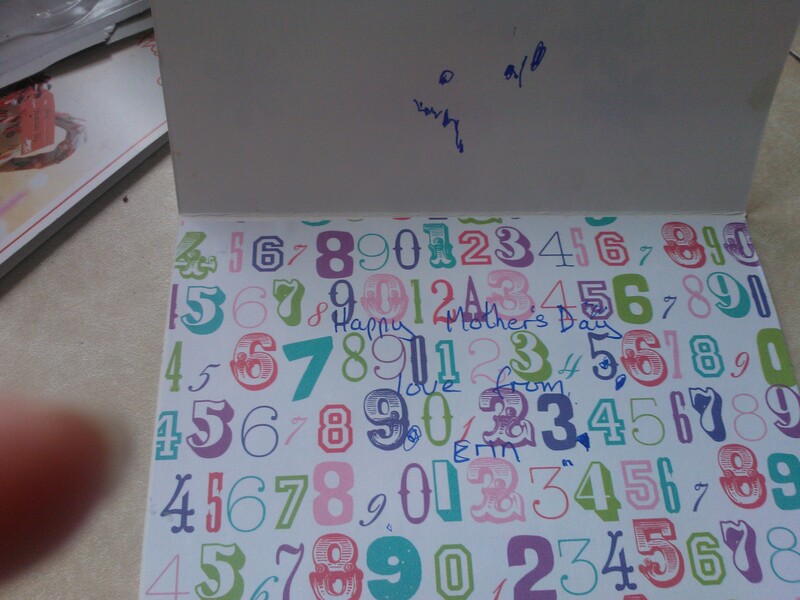 So of course Penny explained that they are not numbers and in fact letters. 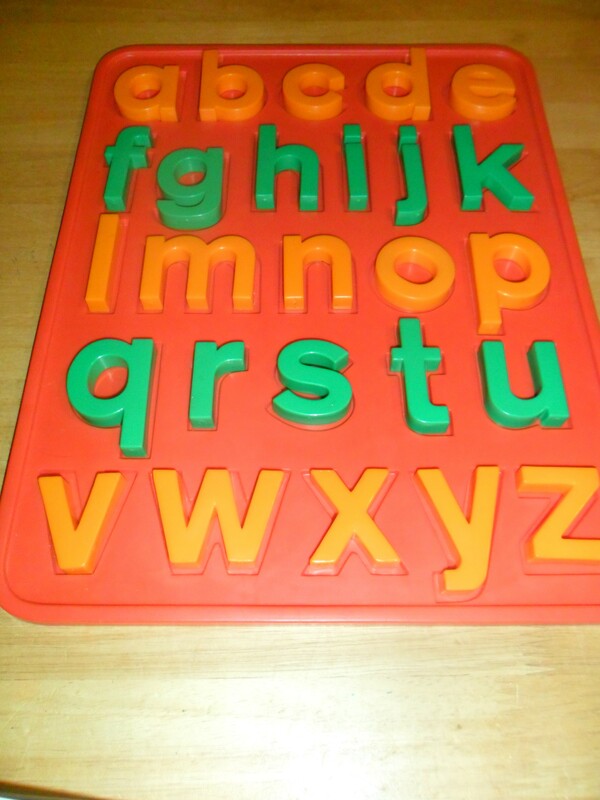 The children then lost all interest and although available – they choose not to play with the alphabet tray much. Penny remembered the very old alphabet book that she had brought from a different charity shop some time ago – again brought because her own children used to have one (yes it has not escaped Penny’s noticed that she should have kept these resources – as would have saved re buying them). 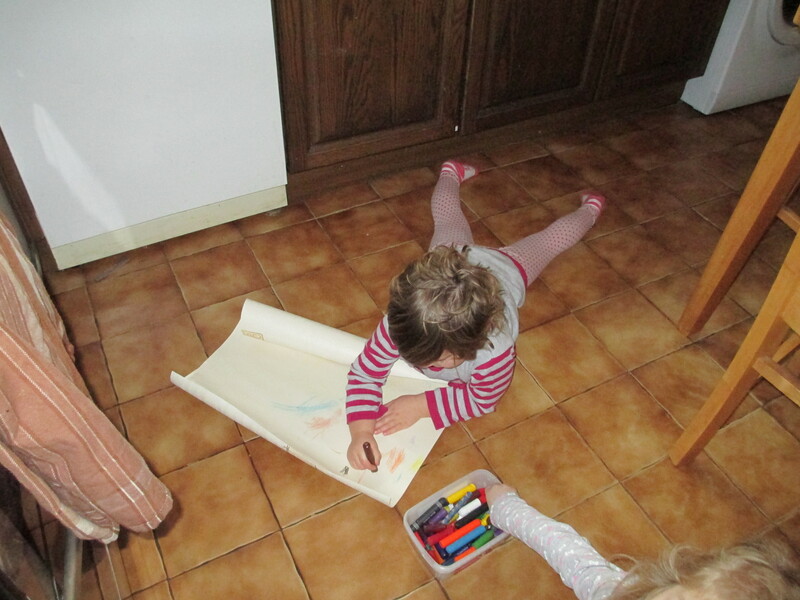 Anyway being the dedicated (and slightly mad) childminder that she is – Penny made a new set of these tracing boards for her setting – and because technology has moved on since 1983 she also scanned and laminated the colour pictures from the book – so also had a set of pictures and a set of letters. All this took time of course (especially as Penny busy campaigning against the government proposals in More Great Childcare and has been rather ill ). And so towards the end of February Penny introduced all these alphabet things to the children – in that she showed them to the children and then left on the side (actually in one of those rather nice wooden trays that the wooden blocks came in – the blocks now being in storage boxes as proved a right pain to keep putting the blocks back in the tray after every use). Which just goes to show that children are not all interested in the same things at the same time – and reinforces Penny’s personal ethos of all things – including phonics – If you provide an enabling environment based on the children’s stage of development, interests – and your knowledge as a practitioner about what might be a potential next step / stage for each child – then each child will use the environment provided in a unique way and develop on the own personal learning journey. So which children showed an interest – and in what ways, and which children didn’t. However before describing the children’s interest – or lack of interest, Penny must make it very clear this is not intended to be an assessment of the children’s development or indeed to say one child is ‘doing better’ than another child – it is just an observation of interests. Chinzia is currently the eldest child attending Penny’s Place and will be 4 in April – up to now Chinzia has shown very little interest in letters or with her name – in that she has been selected her photo name card for months (and knows which card belongs to which friend), however did not recognise her name (without photo) on her place mat or her drawings. However in the last week or so – all that has changed and Chinzia is now very interested in letters, letter sounds and words. In the last week she has started spotting ‘C’ and ‘h’ in the environment (start of her name of course) and uses the ‘ch’ sound, she asks questions about ‘Whats for cake, or house or a million other things every day). She now recognises her name if printed by the computer – although has yet to decipher Penny’s handwriting (not many people can!). Chinzia also now likes to use the magnetic letters to spell her names and that of her friends (with support from Penny) – and if Penny is not around will arrange the letters in nice neat lines on the board. 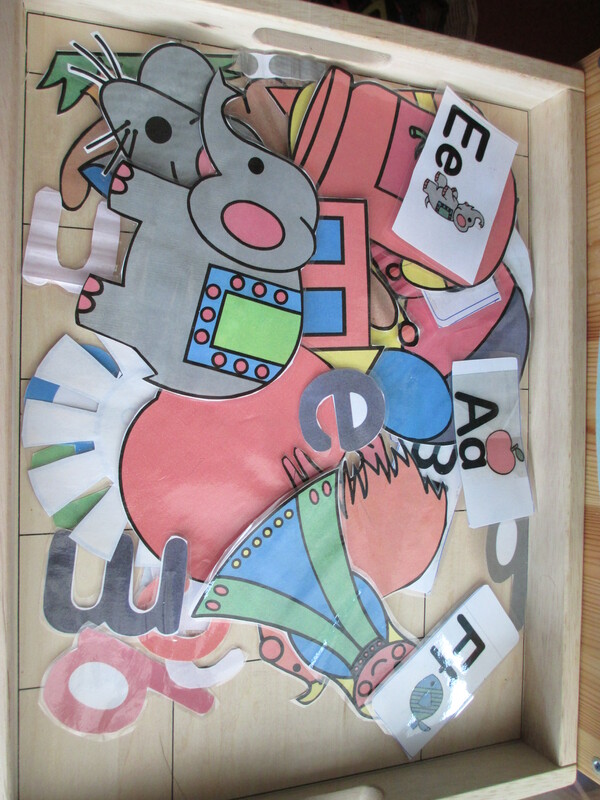 Chinzia can now find the initial letters for all her friends names – both with the magnetic letters, the pictures and in the environment / books. 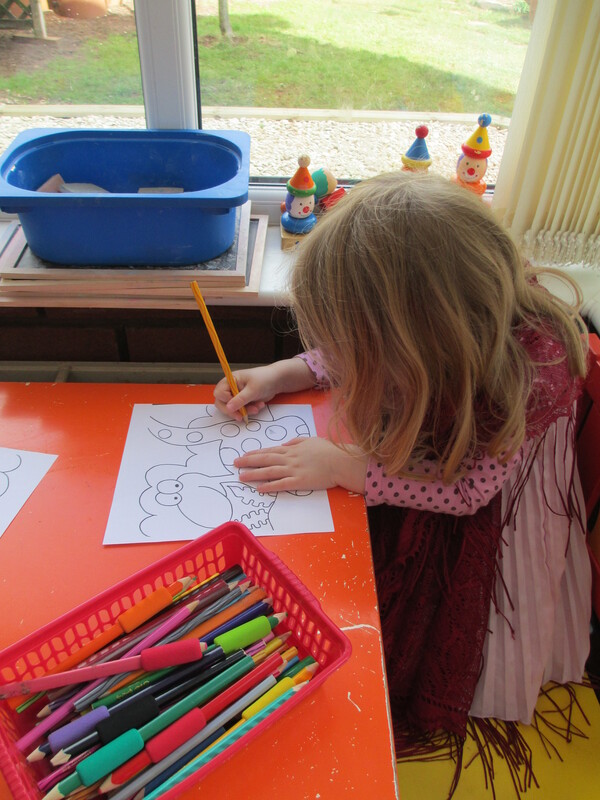 Mia who will 4 in August and like Chinzia will be going to school in September, shows very little interest in letters and sounds at Penny’s Place – she likes to colour the alphabet colouring pictures and knows that the mouse one starts with the same letter as her name. Mia prefers to colour sort the magnetic letters (usually finding all the pink ones) Mia is just not interested at Penny’s Place and currently prefers role play activities. 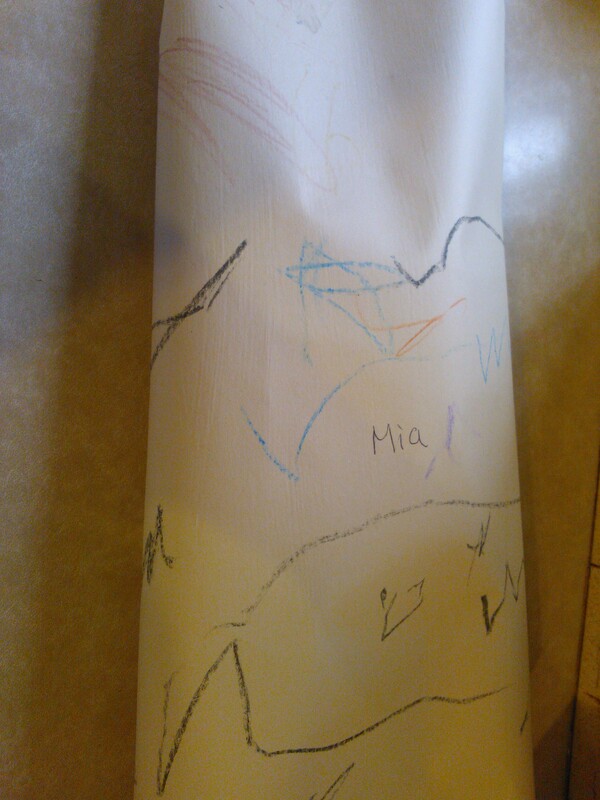 However Daddy tells Penny that provided Mia is in the right frame of mind – she does show an interest in letters and words at home. Erin who was 3 in January – really couldn’t be bothered at the moment – she does like colouring though and sometimes selects the elephant picture to colour as it is her picture (as of course elephant starts with ‘E’ like her name). Erin prefers to use the toy telephones to make calls to mummy – and to – One Direction! Her other big interest at the moment is filling bags to the brim with all sorts of ‘shopping’ or things for her holiday. Shona who is Alex’s twin – is unpredictable – some days she is interested in her picture and chooses to colour it – other days she really has no interest at all. Archie who is the youngest child at Penny’s Place will be 3 in April -he likes to colour the apple picture – but also just as keen to colour dinosaur pictures. So far he is not interested in letter sounds. Does Penny have any concerns – certainly not – in fact she is very pleased with the progress of all the children – and plans to continue to support each child’s individual development path- because she knows that just because interested or not interested at the moment – each child will when the time is right for them,) learn to read and write. Which brings us to the next aspect of this blog – the associated area of writing. 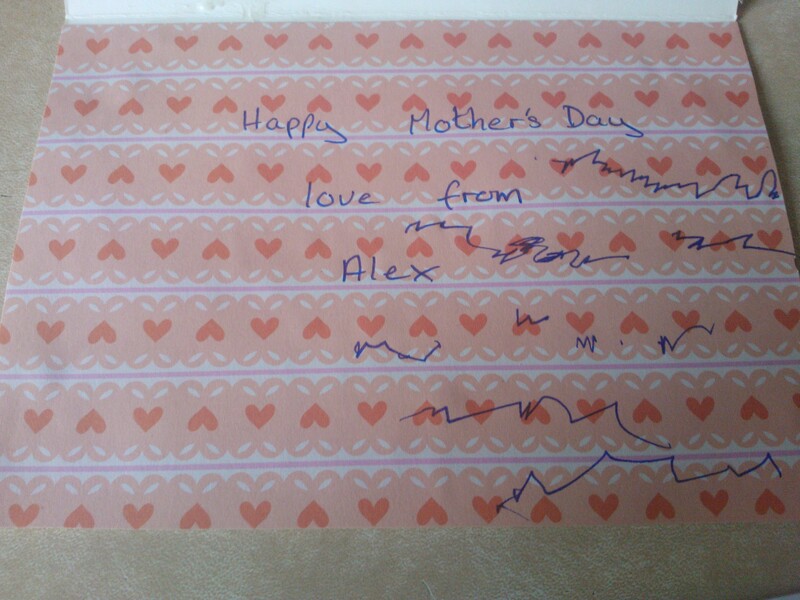 Penny noticed that when we made mother’s day cards that some of the children had stated to mark make in nice neat lines of small marks, she has also notice that Shona is holding her pencil correctly and sometimes makes marks on her pictures telling Penny what it is that she has written. 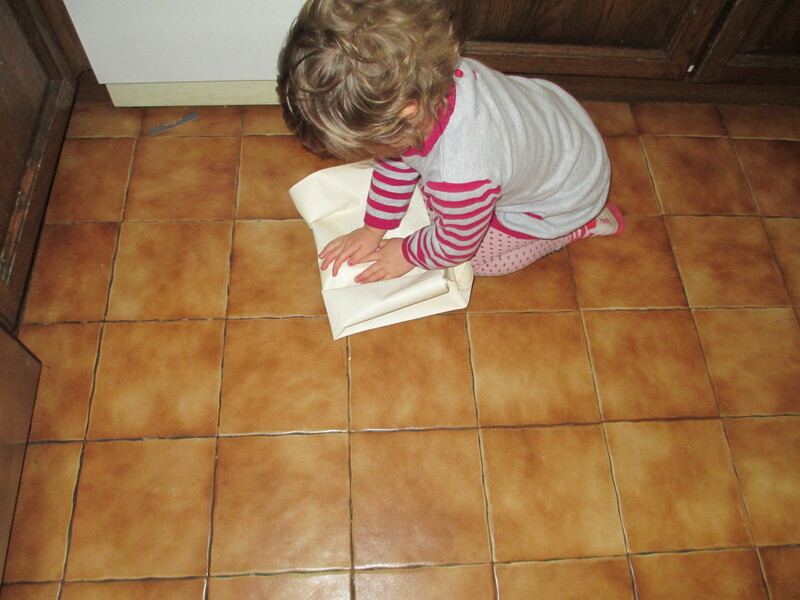 And so as a next step – and including all the children so that they can all take part – if they want to; Penny has brought some exercise books – plain page followed by lined page throughout exercise book. Each child has a book with his or her name in a large font on the front (but no picture / photo or other way of identifying who the books belong to). Not all the children have seen the books yet as they did not attend yesterday, However those they did – Erin, Chinzia and Archie – the books have been a huge success. Erin and Chinzia can ‘find’ their book in the drawer – Archie is more of a lucky guess but then he is younger. All the children self selected their books and the box of pencils several times through out the day – and did lots of mark marking – they even put them away in the drawer when finished (well most of the time). Penny also added some ‘proper’ writing pencils complete with rubbers on the top – although the children still prefer to use the coloured pencils. 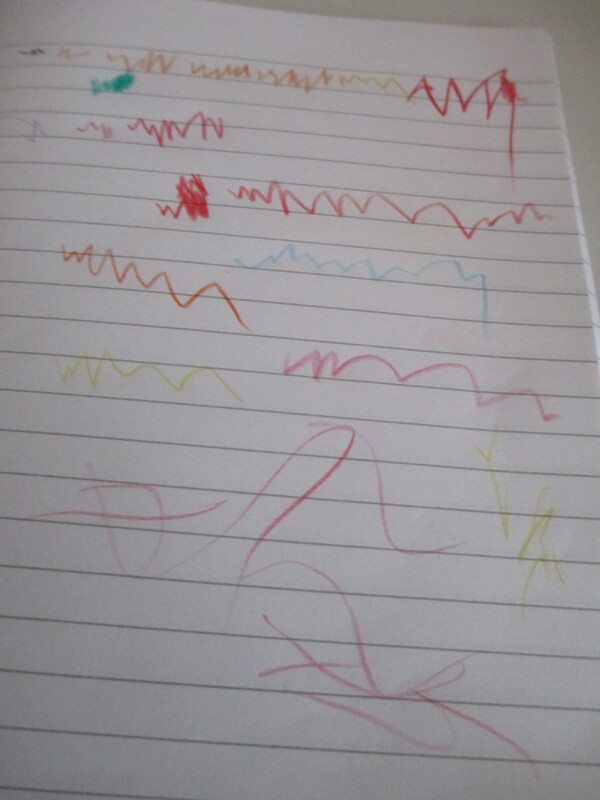 Below is a sample of Chinzia’s mark making – note the mainly neat lines of marks. And the best bit – this is all child initiated – all child led but with appropriate support from Penny in providing resources to support their current stage of development and interests. Most likely the first thing people reading this will notice, is that I am now saying ONCE childminder agencies are up and running – I have stopped saying IF childminder agencies are introduced. On Tuesday 12th there was a meeting with the DfE for those interesting in finding out more and potentially running childminder agencies. I do know people who were at the meeting and I have had some feedback – which along with the information that we already had about the pilots which start in just 6 months time, in September 2013, the notice that the pilots will be evaluated in early 2014 and then rolled out in September 2014. Therefore I have personally come to the conclusion that childminder agencies are going to happen – and that the government want then to be successful and available in all areas of the county. 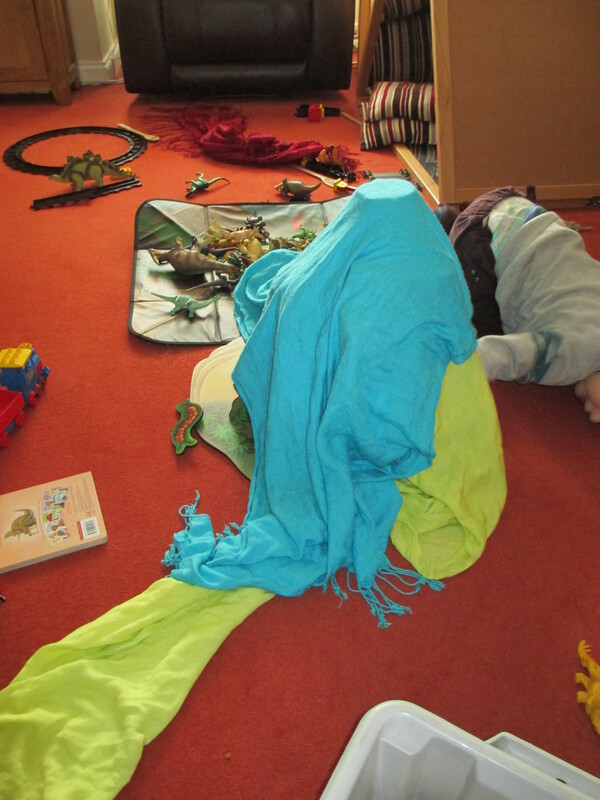 I have lots of questions and lots of concerns about childminder agencies – but for this blog I want to concentrate on the issue of training. Over the last few weeks I have attended some update training provided by my Local Authority, one on infection control and one on safeguarding. Discussion via social media with colleagues, made me realise than even now there are huge differences in what is provided and what the requirements are in different areas of the country. Living in Worcestershire, I am required to do a level 3 course and to be the Designated Senior Member of Staff- Safeguarding, and to update every two years. That is a huge amount of variation – and there is possibly a lot more variation if consider the content of the courses. There are around 150 local authorities in England – so that is in theory around 150 different sets of criteria for safeguarding training and other training that the local authorities have control over. First Aid training is currently a little bit more standard as it has to be 12 hours – however from discussion with others there are still slight variations in actual content. Details about training requirements in the future once childminder agencies are introduced are vague, but we do have some information to base our thoughts on. ‘We will work with partners in further education and training to improve the quality of training available to childcare trainees, including through ensuring that the quality of placements they experience are normally only in good or outstanding settings and are of high quality themselves. We will remove constraints on childcare training; for example, the obligation to use only local authority-approved first aid training. This will ensure that there is competition in the market for high quality training and professional development. Interestingly – it does not say in the section about Ofsted as the sole arbiter of quality on page 37, anything about Ofsted setting the criteria for training. Furthermore from feedback I have received about the meetings about childminder agencies, it is clear that the government are suggesting that childminder agencies will be responsible for the quality of the childminders in the agencies – and could provide initial training, first aid training, child protection training and continuous professional development. My understanding of this is – all training for childminders in the agency. Taking this in relation to the information received about the business models for agencies being open, not government driven and with very few actual requirements, so few ‘must do’ – I believe we have a very worrying picture of the future with regard to training – in fact I think we have a potential for inconsistency and even more variations in content, quality and requirements for training. I think it is a reasonable assumption to think that we will end up with more childminder agencies than we currently have local authorities. Also that some agencies will be huge, some medium size and some small very local ones. I think it is also reasonable to assume that all agencies will be different – for example we already know that we will have self employed models, employed models, those run by schools, children’s centers, day nurseries – and of course businesses. We also know that the services offered will vary, the way the services are paid for will be different, as will the quality of those services. Training for those childminders who choose to remain independent and to not join an agency; Who will provide their training? Who will decide what training or CPD they need to complete? Who will keep track of that training record? (at the moment LA’s hold information of training accessed through them) . Will the LA’s still provide training for childminders – indeed for any provider? Will the fact the providers will be able to access their training ‘elsewhere’ mean that the LA’s will not know who needs training and therefore what and how many courses to put on? Will LA’s find it financially unsustainable to only provide training for those who choose to access training through them? My fear is that ‘market forces’ and more choice will lead to confusion, higher prices and even lack of availability due to the criteria that many colleges and training providers have about not running courses if not enough attendees. However there is another very important issue top be considered – that of working in partnership with colleagues across all sectors of early years. In recent years there has been a huge amount of progress in this area – and although still room for improvement especially around the times training and meetings are held, it is now possible for myself and childminding colleagues to attend training with colleagues from day nurseries, from pre schools and schools and children’s centers, thus sharing good practice and acknowledging our differences but more importantly acknowledging our similarities. If some childminders are to access training via the agency they join, opportunities to share good practice across a range of types of settings will be limited at the least. If independent childminders are to be somewhere in the middle with no clear path for their training needs to be met, and maybe accessing training from independent trainers with no one checking up on their CPD apart from Ofsted every 3 or 4 years. To be frank – it will be a mess and potentially dangerous as time moves on and those market forces lead to more and more variations in amount of training, content of training and cost of training – not to mention no clear consistent tracking of training across all sectors. In my opinion – particularly for registered childminders – this is going to create more divide between childminders and other practitioners, and also between the different agencies and independent childminders- with the possibility of childminders living in the same street either belonging to different agencies or remaining independent. How on earth will parents be able to judge the quality of their prospective childminder? How will parents know if the legal requirements have been met or not? How will comparisons be made so best decision about most appropriate childminder for their child be made? A childminder wants to change agency through choice or has to because moving out of the area that agency operates? A independent childminder wants to join a agency in the future or a agency childminder wants to become independent? How will anyone be able to make an informed decision about if meet requirements for training in these circumstances ? In my opinion there seems to be huge problems about a lot of issues in connection to agencies but that the issue of training in the future is a huge can of worms that no one appears to be acknowledging or doing anything about providing clarification and detail about. However Cathy Nutbrown is joining a long list of experts who have spoken out about the proposals in More Great Childcare. All the major early years membership organisations have expressed their concerns – some more loudly than others – but all are concerned. And around 75,000 people have signed the various petitions – including (currently) 26,761 who have signed the petition that I started – practitioners, parents, grandparents, health professionals, teaching professionals and people from all walks of life. As Cathy Nutbrown said herself in her email to me ‘I hope the many voices will be heard and taken notice of. Lots of people are, like you, doing their best to make a difference, and that’s important’. She is right of course – it is important – very important. Please do whatever you can to add your support to the campaign – I, and many others are ‘doing our best’ – ARE YOU? So over the weekend Penny sent out her usual weekly newsletter to the parents of the children who attend Penny’s Place. Parents of the children and readers of this blog – know that Penny is not a big believer in pre planning and prefers to go with the interests of the children. However Penny does decide on the topic book which forms a loose framework for activities over the next week, month or however long the children remain interested. 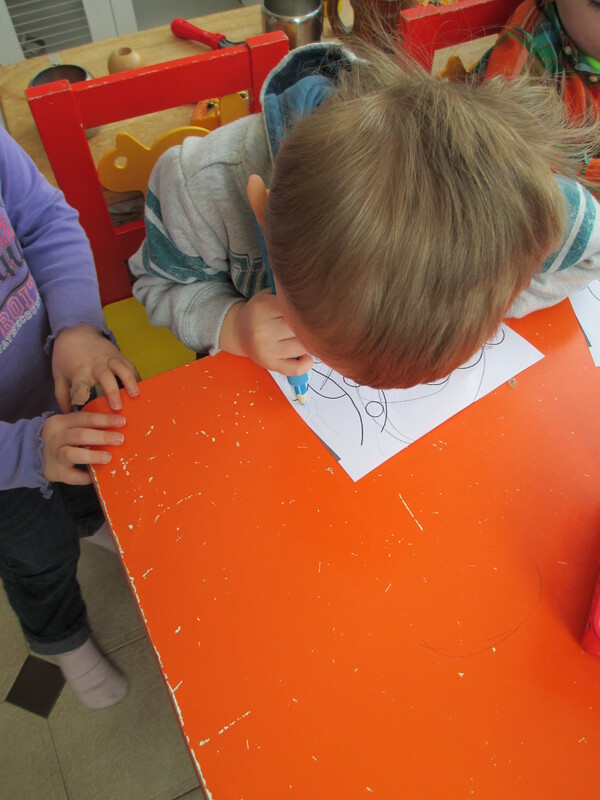 Normally – some days – even some weeks go past with hardly a mention of the topic book ,and other days the children just use the story to interweave in their play – and other days they want to do related activity after related activity. Penny does pride herself on knowing the children well and generally choosing books that match their interests – and can usually link to seasons, festivals and stage of development. 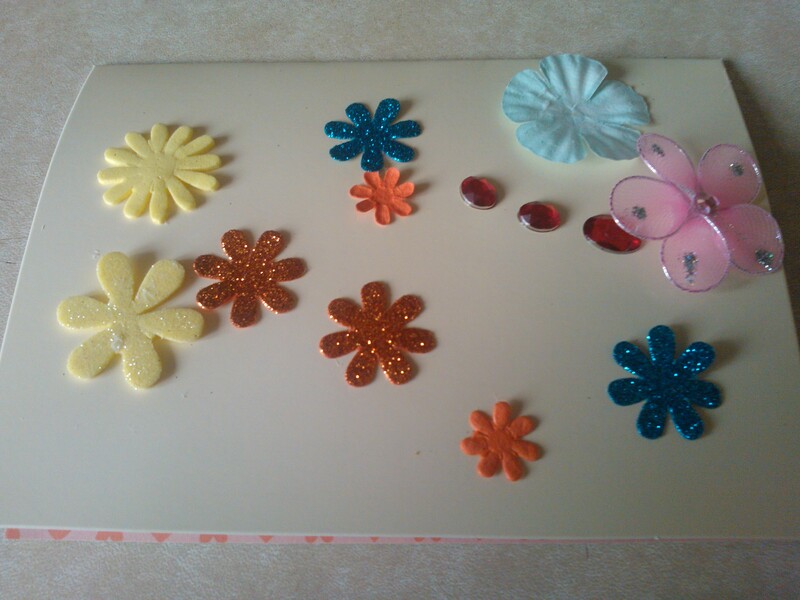 So all set for a topic based on numbers and Spring related things – and well to be honest that was as far as Penny’s planning went as she knew she had lots of books and resources and activities that could produce and do at very little notice. 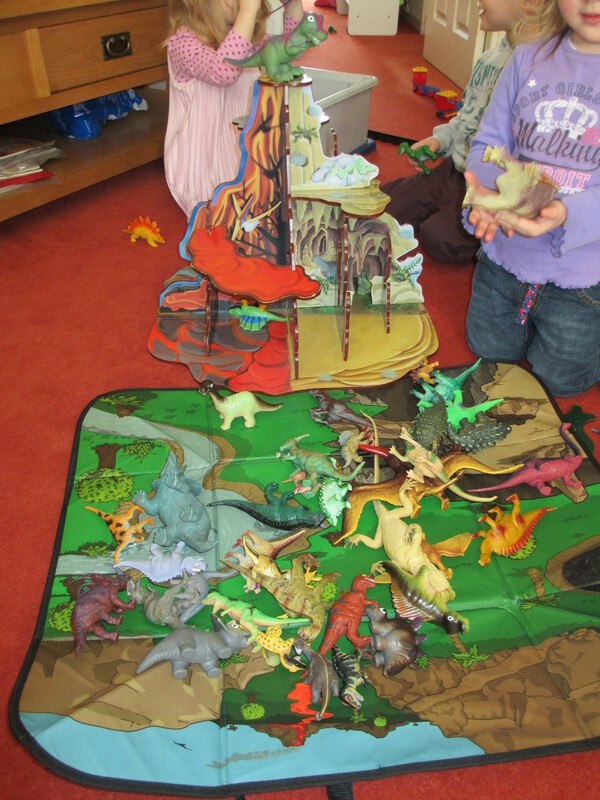 The children arrived – Erin at 6:40, Alex and Shona at 7:12 – and the first part of the day was taken up with breakfast and free play, Then Archie arrived at 8:40 complete with a very nice pair of new shoes – with – yes you guessed it dinosaurs on the side. 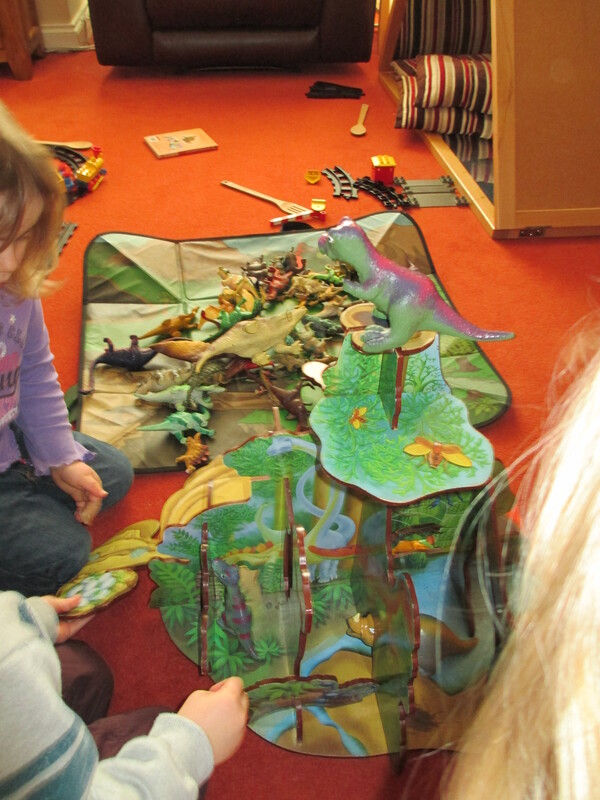 Penny was not surprised as Archie has a long standing interest in dinosaurs – although lately he has not been that bothered with dinosaur play apart from making the odd dinosaur roar in his role play. Of course all the children wanted to see Archie’s shoes, all the children made loud dinosaur nosies – Archie had his breakfast and the children wandered into the lounge and picked up the play from last week that had been popular – namely sitting in the triangle mirror house and pretending to be on a train or in a car – and playing with the duplo train set. Brilliant thought Penny – let’s find some books of the bookshelf to introduce the new topic a bit later on. However as is her way – Penny was observing the children and listening to their play – and realised that actually the play was not the same as last week! Imaginary dinosaurs were riding on the duplo train and getting in the way of the train by lying on the track – this resulting in loud protests from Alex the train pusher and even louder roars from Archie who was insisting the dinosaur HAD to be on the train track (Penny had to smile to herself as both boys were very serious but of course there was not actually a dinosaur – not even a toy one – just imagination). Meanwhile in the mirror house car it seemed that dinosaurs were scaring the teddies and were going to eat them! Naturally Penny stopped looking for spring related counting books and instead went in the garage – because she knew just where something that would support the children was. You see over the weekend – despite the freezing cold weather Mr.Penny’s Place had spent some considerably time moving things out of HIS garage and into HIS brand new shed in the garden. Therefore Penny had spent an hour or two semi sorting her resources that were in Mr.Penny’s Place garage – Penny actually needs some new made to measure shelves before she can sort the resources properly (and move the ‘stuff’ from the loft and the spare bedroom – oh and her bedroom – oh and the kitchen cupboards). However on Sunday evening Penny did manage to get some sort of order by making use of the space just made vacanted by Mr.Penny’s Place – and that is why she knew just where the large box of dinosaur things were – the wooden slot together dino land, the fold out storage box that makes a playmat, the dinosaur books and puzzles – and of course the dinosaurs – in all sorts of shapes and sizes. 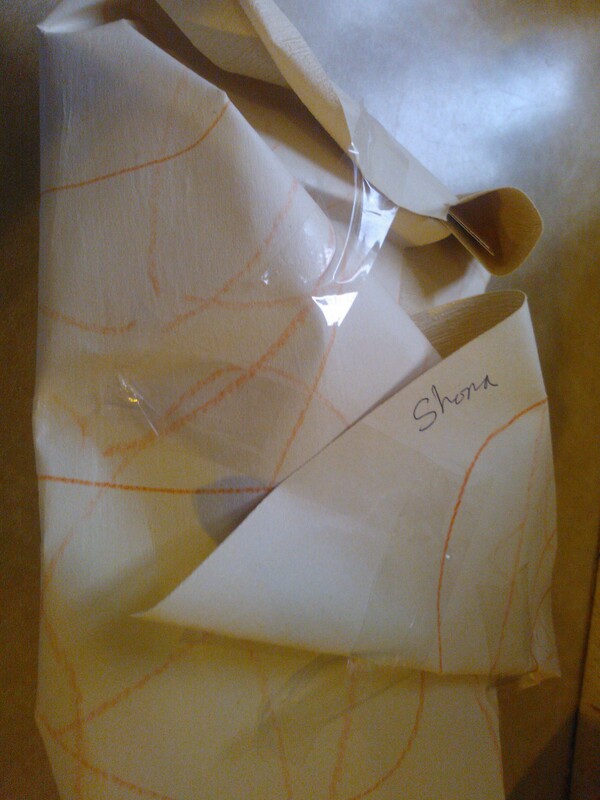 The children were very excited to see this box of things and eagerly helped Penny unpack it . Once all set up Penny let the children do what they do best – explore and play as you will see when you scroll down. However the dinosaur theme did not stop there as Penny very quickly downloaded some nice dinosaurs with numbers on from Twinkl, printed and laminated them (Shona and Erin very interested in this and watched and asked lots of questions) and Penny also found some dinosaur colouring pictures because the children are all very ‘into’ colouring at the moment. Just goes to show – if you think on your feet and go with the children’s interests you can provide a wonderful learning environment and ……. save yourself loads of pre planning! 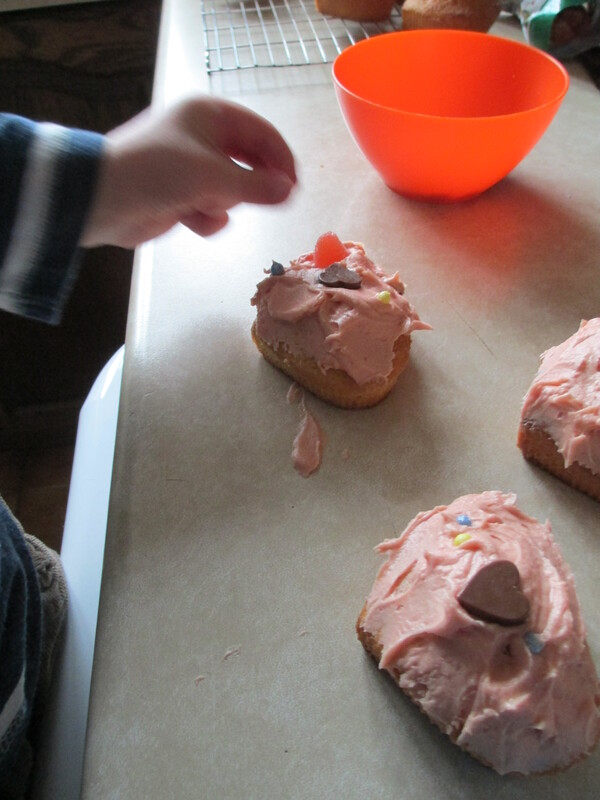 I hope all the Mummy’s – Catherine, Jolanta, Simona, Katy, Lorna and Simona had a lovely Mother’s Day and enjoyed the cakes the children made for you. 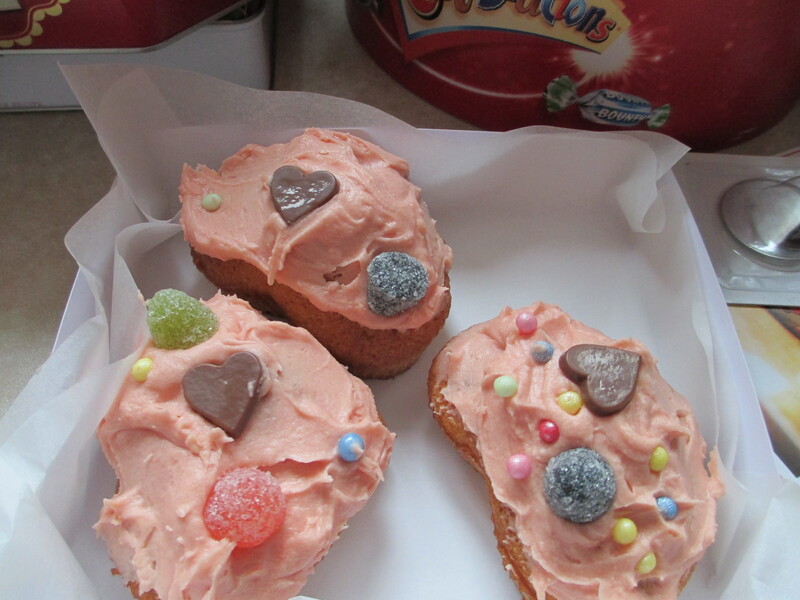 You will of course maybe not ate the cakes as I know the children were keen to ‘help’ with that aspect. I also understand that some of the children have claimed the Teddies as their own and some have even been reluctant to allow their Mummy to display the card. Don’t worry about this – it is all very normal and I had a conversation about this with my daughter Claire who as you know has twins of a similar age to your children. 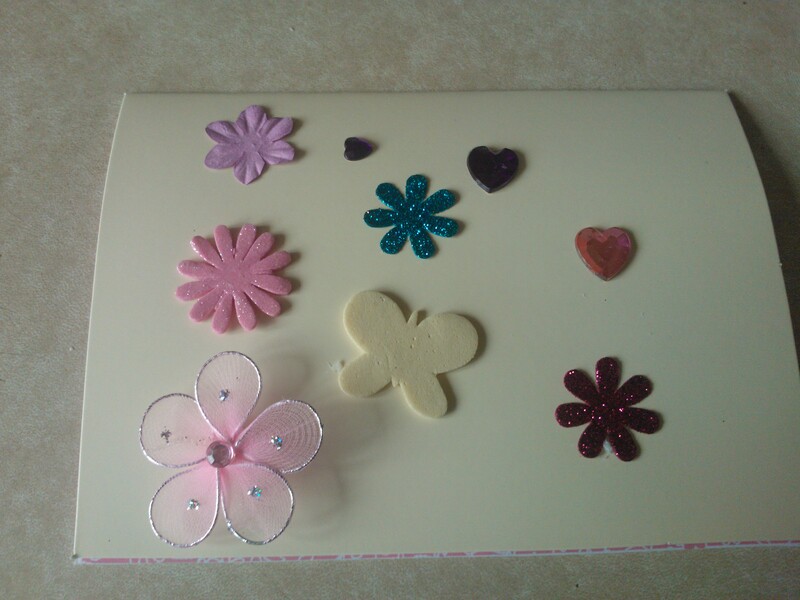 Anyway getting round to the point of this blog – I thought you (and the readers of this blog might like to see some photo’s of the children making your gifts, and some of the finished items as they were all keen to take part and make things for Mummy. And for each Mummy there is a photo of your child / children holding all the things made – but because I want you to see their faces as well – I have printed them rather than put on here without faces as it spoils the impact. 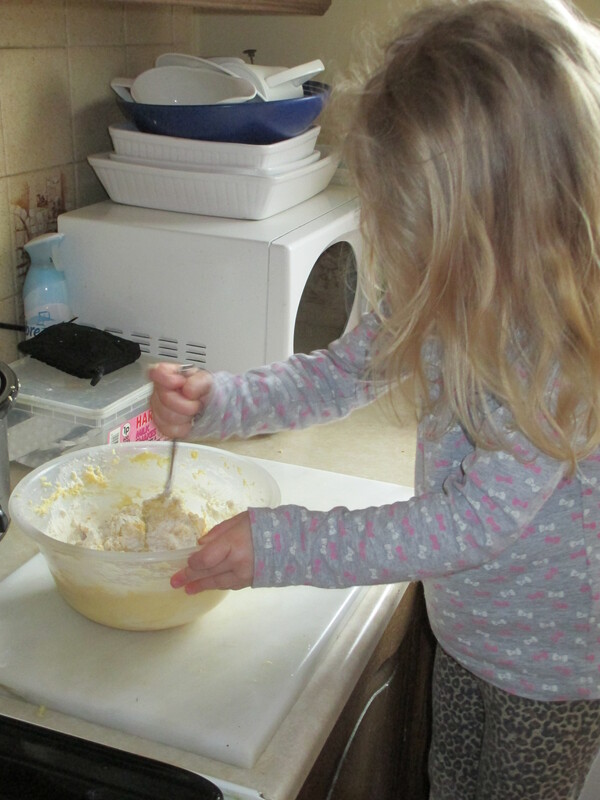 As an experienced childminder I am well aware of the difficulties that can be created by giving children too many choices, and so offer the children in my care a choice of one of two things – occasionally three things. For example – Which breakfast cereal would you like? hoops or krispies? Would you like ham or cheese in your sandwich? Would you like to have the trains out or the cars? and so on. Basic rule – for the youngest children I decide what the choices available will be and the children make their choices from those limited options. I also support the children by asking what they think we could have so that over time they actually help decide what the options will be. And the older the child ,the more options they can cope with and make informed decisions – by school age they will be able to select their cereal from a wider choice – and I would expect them to self select fully understanding the reasons for sensible choices. Often the choice is between doing the ‘right’ thing or having a consequence – so would you like to put away the trains and then we can go to the park? or stay here and play trains instead of going to the park? Would you like to put your lego model safe on the shell or leave it on the floor where it may get broke? And again I support by asking questions so the children think through the consequences themselves, so that eventually they can self regulate their actions and their feelings. And so on – I think most childminders and indeed childcare providers from all types of early years settings are very skilled at helping children to make informed choices and in stopping them becoming overwhelmed with too much choice . Leading to children who over time can make choices and can understand the reasons for those choices and can regulate their feelings around those choices. So maybe this is why as someone who could be described as ‘mature’, I am feeling like I am being treated like a young child who can only cope with limited options – who it is felt by the government, does not need any additional information other than the bits that are being spoonfed over a number of weeks and even months. I am of course talking about the whole childminder agency proposals in More Great Childcare. Despite hundreds, if not thousands of letters to MP’s, Elizabeth Truss and the Prime Minister – no one is answering the questions asked – all we get is patronising remarks about the value the government places on childminders and chunks of More Great Childcare quoted back at us – as if just like children we need things broken down into small chunks and to be told in very basic language – that is is all to make things easier for us, to raise quality, to encourage more childminders into the profession, to increase our professional status – and on and on – repeating the same things – never giving us any further information. WHY NOT – you have to ask – why will the government not tell us the answers to the things we want to know? Where is the research based evidence that supports these ideas? Why are you using out of date data for agencies? Why are you not waiting for data based on inspectitions under EYFS 2012? Why are pilot childminding agencies being planned – ahead of the results of the consultation? Why is there a time scale that has pilots for Sept 13 and for agencies to be up and running for Sept 14? Why are are we being told that there will be a full consultation on agencies BUT on how we want them to work – not if we want them – as that sounds like agencies are a done deal? Can you say why when over 70% of childminders are judged by Ofsted to be good or outstanding you are ‘grouping’ us all together as needing support? You have decided that weaker group providers should have more frequent inspections – why can you not do the same for weaker childminder settings? Why are you are setting up new support services that will be provided by people who want to make profits – rather than allowing those who currently provide service to charge a ‘break even’ cost? Please explain how having a one shop through agencies will be any quicker or cheaper than the current system of going though the LA’s? What will the cost to the childminder be of registering and using the services of an agency? How much will cost to register with Ofsted as a non agency childminder? You have stated that it costs too much to register and inspect individual childminders – and so why can you not just put up the yearly fee to remain registered? Please can you provide figures that show how an agency will be a cost effective model for providing support, monitoring and assessment – because if Ofsted find it too expensive and LA’s can not provide universal support due to the cost of doing so, and ccf networks are decreasing in numbers – in part due to cost – how will an agency be able to provide the services for less? Come on government not telling us is simply not good enough! However the thing that is starting to annoy me is the the agency idea is being pushed through – pilots are being set up – meetings held to discuss the details – and about 6 months after the More Great Childcare was published we will have the pilots up and running – no options – no real consultation – just up and runnig. It is becoming increasingly apparent that many people in this country are completely unaware of the the governments document More Great Childcare. Even people who you think would know – such as childcare providers, trainers of the childcare sector, those professionals that work closely with children and families in other professions such as health professionals. Of course some are very aware – but it seems a lot are not. Of those that have read it, many believe the governments carefully selected wording and ‘cherry picked’ bit of information – and unfounded bold statements about raising quality or making childcare cheaper. Then there are those who believe the often repeated claim that there will be choice about if implement changes or not – such as increasing ratios or joining childminding agencies. However – the government has yet to release the ‘fine detail’ of the plans, to release the research on which More Great Childcare is supposed to be based on, to enter into debate with those who have numerous research based facts to counter the governments claim, or to even answer the genuine questions from the people who are concerned and who have taken the time to write to their MP’s, Elizabeth Truss – who is the minster with responsibility for early years , and even the Prime Minster. Those who do know about More Great Childcare are all expressing their concerns – based on their own personal knowledge and understanding of the impact these proposals will have on the youngest members of society – the children – the children who are under five and unable to speak up for themselves. All of the above are the very good reasons why I set up the One Voice site – unlike this blog – the Penny’s Place Childminding blog – which is unashamedly all about me and my thoughts and my childminding setting – the One Voice site is intended to provide information about all things related to More Great Childcare – so petitions, research documents and consultations as well as many articles as possible from a wide range of media. However views to the site are surprisingly low with around 7,000 pages viewed since the site was launched – asking around it seems people are not aware the site even exists – which is a shame as there is a lot of information on it. Even making changes to the layout to make it easier to navigate has not made a lot of difference. Therefore this information document has been produced as an introduction to More Great Childcare and to provide links to the most important related things – the consultations and the petitions.